Check out Mobility 21’s new Summit mobile website for this year’s conference on Tuesday, Oct. 29 at the JW Marriott at L.A. Live! Sponsor the largest one-day transportation event in California. The Summit is the only place where you can mix and mingle with every transportation CEO in Southern California, policy makers and nationally-known transportation experts. Contact Marnie O’Brien Primmer to sign up today. 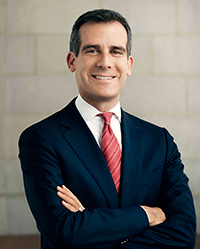 With nearly one month under his belt leading the City of Los Angeles, hear from Mayor Eric Garcetti about his transportation priorities, which include identifying new funding streams and capitalizing on technology. Mobility 21 looks forward to partnering with him on regional transportation issues impacting Southern California. M21: As Mayor of Los Angeles and Metro Board Member, what will your transportation priorities be? EG: Traffic congestion steals billions of hours from our families and billions of dollars from our economy, so I will lead an aggressive transportation agenda to manage traffic and improve mobility for motorists and transit users. I look forward to partnering closely with other cities and agencies across Southern California to develop innovative transportation solutions that serve Angelenos and our neighbors with an eye towards getting the tax payers their money’s worth. Traffic congestion, air quality, mobility and goods movement involve our whole region, not just the City of Los Angeles. L.A. traffic, after all, can result from a trip originating in Long Beach and ending in Beverly Hills. My goal is to provide more options for Angelenos to leave their cars at home so we can shorten our commutes, reduce our carbon foot print and improve our economic competitiveness. I want to be a leader in identifying new funding streams for our transportation projects and will work closely with the federal government on our existing grant commitments. My primary objectives here include securing Federal New Starts grants for the Subway and Regional Connector projects and partnering with the federal government on the next national surface transportation reauthorization bill to ensure L.A. gets its fair share of funding. A transit connection into LAX is high on my priority list. I’ll work closely with LAWA to make this a part of our transportation system as promised to voters through Measure R.
Key to all of this is our capitalizing on technology to provide the best and most cutting edge service to Angelenos and to attract more discretionary transit riders to the system. M21: More than 43 percent of the nation’s imports enter Southern California’s ports — supporting the backbone of our country’s economy but at the same time creating congestion, green house gas emissions and quality of life issues. How do you plan to help support the region’s efforts to bring increased investment to enhance our freight movement infrastructure? EG: L.A.’s Port and Airport are two of the city’s largest economic engines. They are key parts of a national goods movement and logistics chain and the reason L.A. is a premier hub of international trade. Investing in infrastructure is essential. The Port of Los Angeles and Los Angeles World Airports will be investing over $5 billion into our local port and airport facilities to maintain our competitiveness in the global economy. I believe that we can grow and enhance our goods movement infrastructure in a sustainable and environmentally-conscious manner. The Port of Los Angeles has been a global leader in creating innovative solutions to congestion, emissions and community concerns related to Port operations. The Port’s Clean Air Action Plan has set a high standard in reducing air emissions while growing and improving port facilities. The plan has been approved and adopted by local communities, environmental groups, businesses and industry. As part of our larger mobility and community goals, we’ve partnered with neighboring Port of Long Beach. We’ve instituted the PierPass program to successfully move cargo traffic off the roads during peak hours, and we have worked with the Port to plan over $1 billion for the Los Angeles Waterfront project which will give the community direct access to the harbor and waterfront for recreational activities. I’m directing my departments to explore more innovative initiatives like these to enhance our trade facilities while protecting our environment and improving our communities. M21: You have the opportunity as Mayor of the largest city in Southern California to lead our region to a more mobile future. What are your plans on engaging in transportation issues at the regional level? EG: As I mentioned before, a regional strategy is key to achieving our own mobility and transportation goals. I look forward partnering with groups such as Mobility 21 and the Southern California Association of Governments (SCAG) and will have dedicated staff to work on initiatives for managing congestion, improving the movement of goods in our area, and exploring new transportation options throughout the region. I also look forward to working with my colleagues from LA County and foresee a pipeline of collaborations for funding and project development. We can make a big impact regionally by working on projects here in LA, too. I will continue to pursue ideas like an integrated network of bicycle infrastructure and sustainable bus and rail projects that we can one day replicate across the region. As the economic and sustainability powerhouse of the region, we can lead the way in transportation innovation. M21: What should our region be doing — that it isn’t already — to develop a 21st century transportation system? EG: In order to truly foster a 21st century transportation system, we need to focus on technology and innovation. Emerging technologies can help improve the customer experience and result in enhanced mobility, improved safety and reduced uncertainty. Organizations such as American Public Transportation Association (APTA) constantly discuss improved transit usage through technology and innovation. Some examples of technology include smart mobile phone ticketing payments and real time “open-data” information for patrons. As we continue the installation and integration of our Transit Access Pass (TAP) and gate-latching, the MTA should take advantage of and explore new technological opportunities using this fare system. The TAP system could also help maximize our fare collection, and I am dedicated to making this a priority. My first motion as an MTA board member centered on these issues. M21: Will you support the use of innovative financing and encourage the use of public-private partnerships to complete the promise of Measure R? EG: Yes, a primary focus of my administration will be innovative financing to create jobs and make City Hall work better. In terms of public-private partnerships, we must focus on project management and staying on schedule and on budget. We also need to look at other projects in the region that will benefit from this approach. Given the limited resources of governmental agencies, P3s are an avenue to deliver major infrastructure projects, and it is my goal to ensure we are aggressive in exploring them. The I-215 Widening Project in San Bernardino is a partnership between the San Bernardino Associated Governments (SANBAG), Caltrans, the City of San Bernardino and the Federal Highway Administration, which contributed $128 million in American Recovery and Reinvestment Act (ARRA) funds to help stimulate the local economy. In addition to the ARRA funding SANBAG received, the project was funded by a combination of Proposition 1B funds and Measure I – the voter-approved half-cent sales tax for transportation improvements in San Bernardino County. This 7.5-mile, $723 million expansion and revitalization project will help reduce congestion and improve traffic flow on this important freeway that serves as a gateway to Victor Valley, Riverside County, Orange County, Los Angeles County and points beyond. Work is nearing completion on the project designed to connect residents, motorists, visitors and goods movement in Southern California. Phase I of this four-phase project started in 2007 with the construction of the 5th Street Interchange. The completed facility will add one general use and one carpool lane in both directions, freeway connectors and auxiliary lanes. New on-and off-ramps and reconstruction of all bridges and underpasses throughout the corridor display artistic wallscapes that reflect the San Bernardino Mountains, arrowhead, railroad history and natural springs in the area. SANBAG does regular video updates on YouTube to keep the public engaged and aware of what work is being done on the corridor. For additional information about the project, go to www.215news.com. Earlier this month, a $421 million federal Transportation Infrastructure Finance and Innovation Act (TIFIA) loan to fund the construction of the 91 Project, formerly known as the State Route 91 Corridor Improvement Project, was completed. In addition, financial close on more than $638 million of toll revenue bonds and sales tax revenue bonds payable from the Measure A half-cent sales tax initiative was completed. Work is underway in Orange County to separate car traffic from train traffic to enhance the flow of goods, safety and mobility. Sitting in your car waiting for seemingly endless trains at rail crossings in north Orange County will soon be a thing of the past. Orange County Transportation Authority (OCTA) and city leaders held a construction groundbreaking event on July 24 on two more projects that will separate street traffic from trains. The Orangethorpe Avenue and Tustin Avenue / Rose Drive grade separation projects are the second installment in a series of projects, known as the O.C. Bridges program, that will eliminate the need for drivers to waste time idling at a rail crossings waiting for trains to pass. The $600-million program is working to improve traffic flow and enhance safety at seven crossings along the Burlington North Santa Fe rail line in Anaheim, Fullerton and Placentia by building a series of bridges – both underpasses and overpasses. Nearly 70 trains a day travel along the Burlington North Santa Fe rail line through Anaheim, Fullerton and Placentia, and that number is anticipated to increase more than 45 percent by 2030. Transportation officials say these projects will help reduce traffic delays as trains will be traveling through each intersection every 10 minutes. Placentia Avenue, which borders the cities of Fullerton and Placentia, and Kramer Boulevard were the first of the seven projects to begin construction in early 2012. OCTA officials anticipate work at Lakeview Avenue, Raymond Avenue and State College Boulevard to begin in early 2014. For more information, visit www.ocbridges.com. CH2M HILL proudly supports Mobility 21’s goals to provide practical solutions to Southern California’s transportation challenges. CH2M HILL is a pioneer in the planning and implementation of Great Streets, Complete Streets and multimodal transportation solutions helping communities plan, design and revitalize urban roadways for all users – including bicyclists, public transportation vehicles and riders, and pedestrians. CH2M HILL is also at the forefront of structuring public-private partnerships in which risk is tightly controlled, asset performance is assured and shareholder value is maximized. CH2M HILL’s goal is to provide its clients and their communities with a transportation legacy. CH2M HILL’s projects include the current State Route 710 North Project Report/Environmental Document, planning and design support to Caltrans Districts 7, 8 and 11, Executive Advisory services to LA Metro to implement Measure R rail projects, support to the California High-Speed Rail Authority, involvement with OCTA’s “Go Local” Fixed Guideway Program to improve the overall transportation system and quality of life, and the recent award winning work for the Green Line Extension & Orange Line Low Floor Stations in San Diego. Building America’s Future (BAF) released a new mobile app called “I’m Stuck” that will allow delayed commuters around the country to directly and immediately e-mail their U.S. Representative or Senator to share their frustration. The “I’m Stuck” app is available for free download in the app stores and on the BAF website. It will run on both Android and Apple devices. 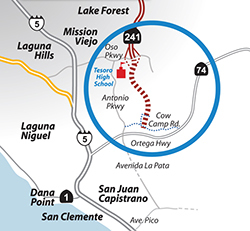 Last month, in a 3-2 vote, the San Diego Regional Water Quality Control Board turned down the State Route 241 Tesoro Extension’s Waste Discharge Requirements Permit – even though Regional Water Board staff had recommended its adoption. As a result, the Foothill/Eastern Transportation Corridor Agency (F/ETCA) Board of Directors has been assessing the options available for advancing the project toward the construction phase. The Regional Water Board outcome was especially disappointing for local residents in support of the project. A recent public opinion survey showed that South Orange County supports the 241 Tesoro Extension by more than a two-to-one margin (61 percent support and 27 percent oppose). In San Juan Capistrano, the city closest to the project, resident support is even greater (67 percent). Of those surveyed, 76 percent said that the project will be particularly helpful on holidays and weekends, when traffic on Interstate 5 is heaviest. The 241 Tesoro Extension’s water quality measures have been designed to go above and beyond standard construction requirements to minimize and offset any potential impacts to waterways. The project will permanently impact 0.4 acres of jurisdictional waters of the state of California. To compensate for these impacts, the F/ETCA proposes approximately 34 acres of wetlands creation and enhancement and upland watershed buffer restoration. F/ETCA’s mitigation ratios on the project will be 20:1. Typical mitigation for projects of similar size is 3:1. Parsons Corporation believes strongly in the importance of transportation improvements to the benefit our economy and quality of life. Parsons has helped build the infrastructure of California since 1944. Parsons’ corporate headquarters, located in Pasadena, serves as a launching platform for many of the major facilities it has designed and constructed throughout the world. Parsons’ mission is to provide the best services to its customers integrating its six core values – Safety, Quality, Integrity, Diversity, Innovation and Sustainability. Parsons employs more than 12,000 professionals worldwide with offices on 5 continents and has built more than $30 billion of infrastructure in the last decade alone. Parsons is proud of its aviation accomplishments in Southern California. 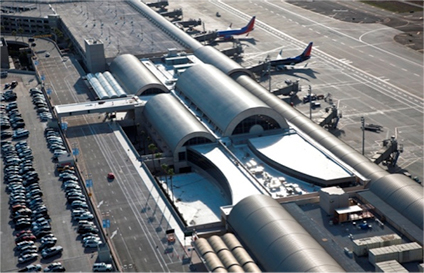 Some of Parsons’ recent projects include the expansion of the Orange County John Wayne Airport, having completed the addition of Terminal C, including a new parking structure and power plant facilities. Parsons has also been working at Los Angeles World Airports (LAWA) for decades and helped manage the expansion of the newly opened Tom Bradley International Terminal and is part of LAWA’s ongoing expansion program. Parsons has been a leader in rail and transit as well with the recently completed Exposition Line in Los Angeles and the Pasadena Gold Line. Parsons is currently in a joint venture (JV) with Kiewit in completing the Foothill Gold Line Extension from Pasadena to Azusa. Parsons also was a JV team member for the Alameda Mid-Corridor Trench project serving the Ports of Los Angeles and Long Beach. Parsons delivers both transit and Class 1 railroad projects and is a leader in grade separation projects serving as the Program Manager for Orange County Transit Authority’s (OCTA’s) seven railroad grade separation projects that are currently in progress. 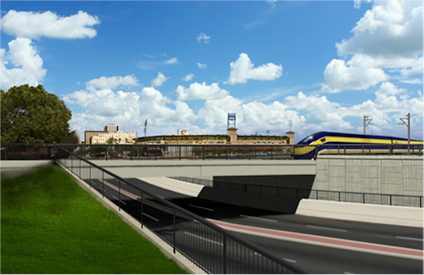 Parsons is also working on the first design-build of the California High-Speed Rail project. 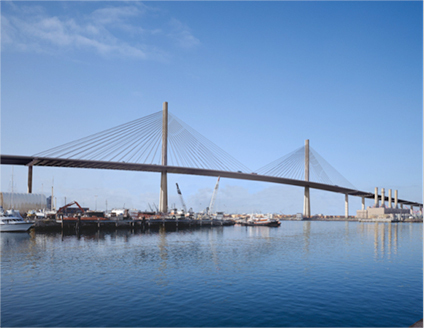 Bridges and tunnels link our communities, and Parsons has been a leader in numerous projects, including the Gerald Desmond Bridge for the Port of Long Beach, the New Carquinez Bridge and Caldecott Tunnel in San Francisco, and many other projects in the region. California roads are vital to our economy, and Parsons is involved in the planning, environmental design and construction for many roadway facilities, including freeways and toll facilities. 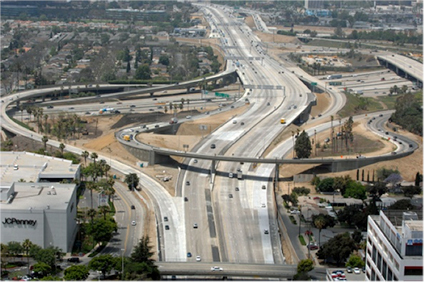 Parsons’ Road and Highway group works closely with Caltrans and the Mobility 21 members on freeways across California. Parsons is leading the effort on the I-405 widening in Orange County, SR-91 Design-Build in Riverside County, I-10 HOV lanes in San Bernardino, and the High Desert Corridor in Los Angeles County. 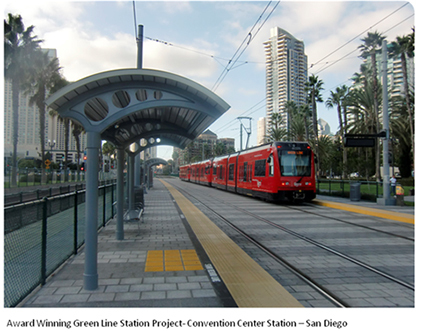 “Parsons is committed to transportation improvements to the benefit of society. It is a privilege to work with many leaders devoted to a common goal of enhancing the mobility of the traveling public,” stated Kevin Haboian, Parsons Senior Vice President and Mobility 21 Advisory Board Member. In a continuing effort to encourage safe biking – both as a solo means of transport and as a gateway to transit – Metro is offering free bicycle traffic skills classes all over L.A. County through September. Metro has received a California Office of Traffic Safety (OTS) grant and is working with local non-profit bike organizations to conduct up to 120 English and Spanish traffic skills classes countywide. The $203,000 grant, awarded earlier this year to Metro by the California OTS through the National Highway Traffic Safety Administration, will fund bicycle traffic skills classes for prospective or experienced cyclists interesting in increasing their bicycle traffic skills. Metro has contracted with the Los Angeles County Bicycle Coalition (LACBC), Bike San Gabriel Valley (BikeSGV) and Multicultural Communities for Mobility (MCM) to conduct three- or eight-hour weekend classes through September 2013. Metro plans to reach up to 1,440 people for the classes. Each participant will receive a safety manual, helmet and bicycle lights for successfully completing the course. Classes will be taught in cities throughout Los Angeles County, including L.A., Culver City, La Verne and Azusa. Participants must be 18 years or older and be L.A. County residents. LACBC will host 30 eight-hour classes, 30 three-hour classes, and one advanced-level seminar. BikeSGV will provide 30 three-hour classes, and MCM will teach 30 three-hour Spanish language courses.